DS titles Pokémon Soul Silver and Heart Gold went on sale in Japan on September 12. Pokémon DS games? Bet lots of people bought them. In they're first two days on sale, Soul Silver and Heart Gold sold 1,408,980 copies of the game. 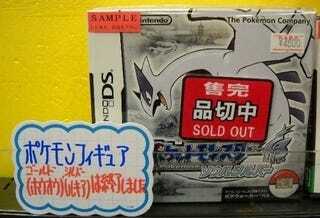 The title sold out at locations across Japan, so the demand is even higher than those sales indicate. Over the weekend, Nintendo released Pokémon Heart Gold/Soul Silver. The games are remakes of Gold and Silver, which sold 23 million copies worldwide.